I have a Christmas party tomorrow so will head to Spotlight to buy the lining, googly eyes and some cord for the drawstrings. I cant believe how productive I have been the last 10 days....must be something in the air! I ve got the christmas cards quilt all finished and hanging on my wall, it was a great quilt to make. What great projects! 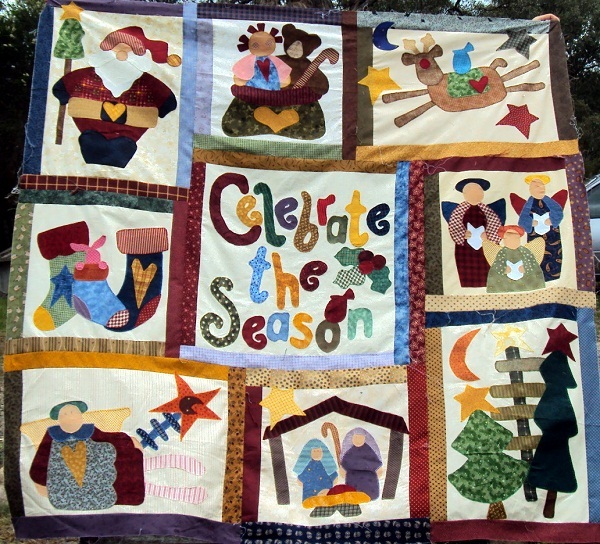 Love, love, love the Celebrate the Season. Makes me want to do applique right now! You have been a busy little elf. The sacks look great. And who doesn't love that Chook shed pattern. You have been very productive. Everything looks fantastic. Go Deb!! You really are getting lots done. The Santa sacks are really fun!